Getting a difficult plant to bloom is extremely satisfying |Sundews Etc. Woo hoo! Now we're cooking with gas! My Drosera spiralis is blooming. I'm so excited! Seriously, when I realized this was a flower stalk rather than a new leaf I started hooting in excitement and did a stupid little dance in my living room. I'm glad no one else was home. Back when I acquired the plant back at the Winter 2014 BACPS meeting I learned that it's considered somewhat finicky and difficult to keep. As I noted in my profile of the species, a couple growers recommended I remember to tell the plant "goodnight" in case it was dead in the morning. Well, after keeping this plant for the better part of a year, having it survive the warmest part of the year, and now begin to bloom, I think that my conditions are pretty favorable for its growth. D. spiralis has gotten quite tall. The leaves are 8+ inches (20+ cm) long! I think a lot of the problems other growers have probably have to do with light. The habitat photos of this plant show it growing in really intense light. Consider these photos posted to the Drosera and Roridula Facebook group. That's not windowsill light! I suspect that even the shading used in lots of greenhouses to keep temperatures under control might be blocking more light than the plant would prefer. Mine grows right under six T-8 bulbs. Without that much intensity I doubt it would be healthy enough to consider flowering. I've also got a new little hitchhiker in the pot. The little sundew just wants to hang out with the cool kids. 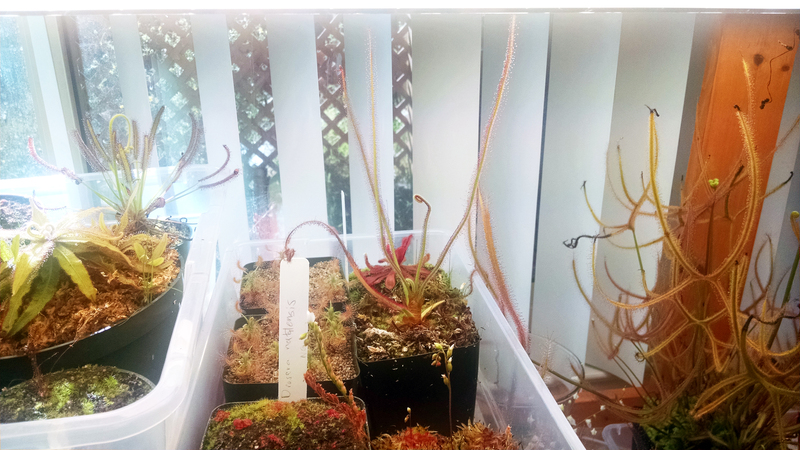 I suspect that it might be Drosera capillaris, since those two pots lived pretty near each other for some time. No matter! It'll get bigger and I'll remove it. In the mean time, I can't wait to see these flowers. I know that Brazilian sundews can be manually self-pollinated, though it doesn't usually result in a great seed set. Still, I'll give it a shot and see if I can get at least a few seeds to start. And even if I don't I can still feel pretty good about getting a relatively difficult plant to flower :) Once the flowers open and I get some pictures I'll update the Plant Profile. Amazing, such a great plant - fantastic that you're able to grow it so well AND get it to bloom!! I haven't had much success with this plant in years past, but seeing this post makes me want to try it again. Any suggestions on sources on where to obtain D. spiralis? Brilliant growing and wonderful blog! Looking forward to seeing more. Cheers! Thanks Rob! 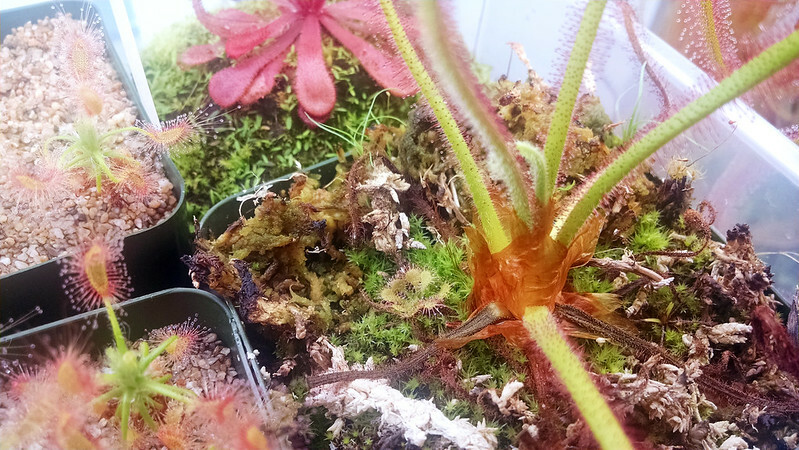 California Carnivores sometimes has D. spiralis available – I got mine from them when they brought it to the winter BACPS meeting. It may be listed as D. gramnifolia, since the names have only recently been reshuffled. Otherwise I occasionally see private growers selling or trading D. spiralis, but it's not too common. 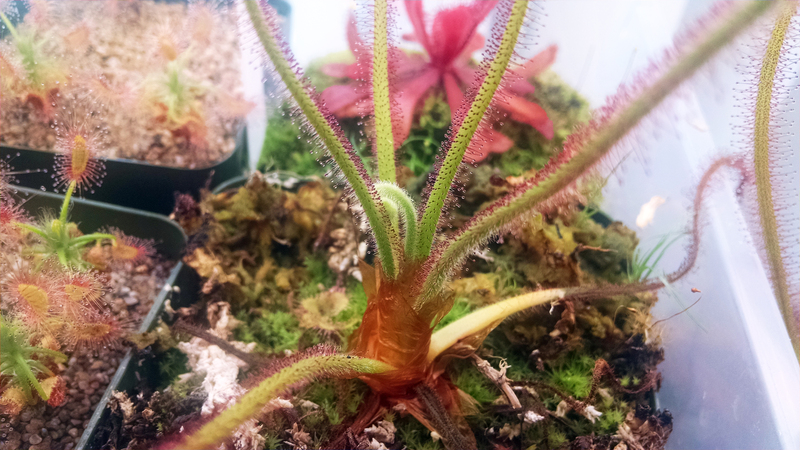 I think I'm going to attempt a leaf cutting after this bloom (apparently Aaron over at Grow Sundews had some success with it), and I'll let you know if I get any action on it.